At the beginning of my MA studies in autumn of 2014 there was an obligatory subject, ‘History and Social Memory’, about the developments of history writing, the peculiarities of collective memory and historical memory as its part. One of the main things explored in the seminars was the lifespan of memorials: starting with their construction, followed by changes to their original idea or their destruction, and, if applicable, their rebuilding. Being a person who is deeply interested in the history of the Baltic states, particularly of Lithuania – and, to be even more precise, Kaunas – I was extremely interested in having a closer look at the Garden of the War Museum of Vytautas the Great (Vytauto Didžiojo Karo Muziejaus sodelis) in Kaunas (at Donelaičio street 64). The Museum was opened in 1921, and the development of the Garden started at the same time. By 1940 the site had become thick with Lithuanian national historical memory, consisting of monuments dedicated to prominent Lithuanians (Jonas Basanavičius, Vincas Kudirka and others) and events (the Wars of Independence against Soviet Russia, the Bermontians, Poland in 1918-1920 and the seizure of Klaipėda in 1923). Having been destroyed during the Soviet time, the Garden was rebuilt after the restoration of independence, using funds collected by the people in 1988-1990. Here, however, I am going to focus exclusively on one particular part of the Garden: the Monument to the Fallen for Lithuania’s Freedom (Žuvusiems už Lietuvos laisvę, 1921), and its immediate surroundings, consisting of the Altar with the Eternal Flame in front of the Monument, the Grave of the Unknown Soldier in between them (Nežinomo Kareivio Kapas), and the busts of Povilas Lukšys and Antanas Juozapavičius – respectively, the first soldier and the first officer killed in the Wars of Independence in February 1919 – on the both sides of the Monument to the Fallen. Additionally, we should not forget the wooden crosses and praying poles behind the Monument. The Monument to the Fallen for Lithuania’s Freedom (Žuvusiems už Lietuvos laisvę, 1921) was the first monument in the Garden of the War Museum, being erected on October 16, 1921, to a design by sculptor Juozas Zikaras and architect Vladimiras Dubeneckis (later, the former would create several busts of the leaders of the national awakening movement in the same Garden, and the latter would construct the building of the Museum (completed in 1936) which we can see nowadays). The pyramidal structure was made of stones collected from the battlefields of the Wars of Independence. Above the motto (Žuvusiems už…) there was a cross, above which there was a sword under the shield which carried the cross with two horizontal lines (the one which is seen on the Vytis – the Lithuanian coat of arms). 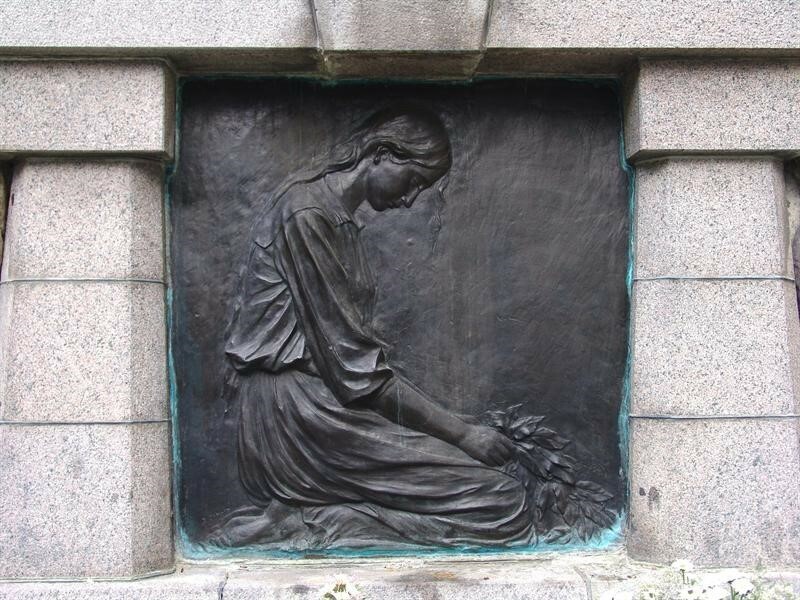 Below the motto, at the base of the monument, there is a bronze plaque depicting a woman (a sister? A wife?) laying flowers on a soldier’s (her brother’s? Her husband’s?) grave. The Monument was surrounded by a metal chain which was connected to the artillery shells on the ground. The six-metre-high Monument to the Fallen was crowned by a metal cross presented to the War Museum by the Dean of Plungė (in Western Lithuania, the region of Samogitia – Žemaitija in Lithuanian) in October 1923. On November 23, 1923, Lithuanian Army Day, a fire was lit next to the monument symbolising the special gratitude to the fallen. The Altar (“aukuras” in Lithuanian) with the Eternal Flame was built in front of the monument depicting the words “Redde quod debes” (“pay (give) what you owe” in Latin ). On November 23, 1934, the Unknown Soldier was buried between the Monument and the Eternal Flame. The remains had been brought from Latvia, Ilūkste region (between Rokiškis in Lithuania and Daugavpils in Latvia). The soldier, killed in action in 1919, was awarded the Order of the Vytis Cross, the 3rd degree by the president Antanas Smetona. Today, the granite plaque on the ground says: “The Unknown Soldier who died for Lithuania’s freedom, 1919” (Nežinomasis Kareivis žuvęs dėl Lietuvos laisvės 1919 m). On September 7, 1938, on both sides of the Monument, two busts on high pedestals created by the sculptor Bernardas Bučas were erected. The one on the left (if standing in front of the Monument) is dedicated to the first officer, Antanas Juozapavičius, killed in the Wars of Independence. It is written on the pedestal: “1919.II.13 / Reborn Lithuania’s / officer, first / killed for its / freedom” (1919.II.13 / ATGIMUSIOS LIETUVOS / KARININKAS, PIRMAS/ ŽUVĘS DĖL JOS / LAISVĖS. The one on the right is dedicated to Povilas Lukšys, the first soldier killed in the same action. On its pedestal, we find the following text: “1919.II.9 / Reborn Lithuania’s soldier, first / killed for its / freedom” (1919.II.9 / ATGIMUSIOS LIETUVOS / KAREIVIS, PIRMAS / ŽUVĘS DĖL JOS / LAISVĖS). Moreover, there were wooden crosses and praying poles behind the Monument. Those structures are the Lithuanian folk symbiosis of Christian and pagan symbols which are widely spread across the country even today. In 1921-1922, four crosses, two poles with rooftops (“stogastulpis” in Lithuanian ) and one praying pole (“koplystulpis” in Lithuanian ) were placed on both sides of the Monument. Five of the structures were brought from Žemaitija, two were procured by the Union of War Invalids. By 1939, there were twelve structures standing next to the Monument, six on each side. With the Soviet occupation came hard times for the site of memory. In 1949 or 1950, the Monument to the Fallen for Freedom, the Grave of the Unknown Soldier and the Eternal Flame, as well as the wooden crosses and poles, were demolished. On July 21, 1951, on the same site, a bust of Felix Dzerzhynsky [a Polish-Russian Bolshevik revolutionary and the founder of the Cheka, the first Soviet secret police force] was constructed on a high pedestal, commemorating the 25th anniversary of his death. The fate of the busts of Antanas Juozapavičius and Povilas Lukšys was more dramatic. Between June 15-22, 1941, on the eve of the outbreak of war between Germany and the Soviet Union, those monuments were taken away from the Garden, following a decision on May 23, made by the bureau of the Central Committee of the Lithuanian Communist Party. On July 27, under the Germans, they were returned to their place. After the war, on April 20, 1949, with Lithuania again under Soviet rule, the act to demolish those monuments was signed. The reason given was that they did not have artistic merit. All the monuments in the Garden of the War Museum were restored with public donations from 1988-1990. Trying to interpret the meaning of the monument and its surroundings during the interwar period it would be interesting to see whether the theoretical explanation of the war memorials of Western Europe would be adequate in the case of Kaunas. There are two texts of particular interest here. The first one is extremely influential on the research on historical memory, and was written by the German historian Reinhard Koselleck: “War Memorials: Identity Formations of the Survivor” from the book The Practice of Conceptual History: Timing History, Spacing Concepts. Another one is “Monuments to the Dead”, written by the French historian Antoine Prost, found in the second volume of Realms of Memory edited by Pierre Nora. The name of Nora is strongly connected with the concept of lieux de mémoire (realms/sites of memory). Thanks to the three volumes of Realms he edited, in which authors, including Antoine Prost, attempted to describe and explain the meaning of certain books, places, events and other things dear to the French national memory, the concept became influential around the world. The Garden of the War Museum in Kaunas, and the Monument to the Fallen with its surroundings in particular, is the site of the Lithuanian national consciousness with its roots in the past. Focusing on war memorials constructed from the time of the French Revolution until the post-WWII monuments in Western Europe (also in Russia after WWII), Koselleck sees these places of commemoration as a means of identification. Those killed in action are identified as heroes, victims, martyrs, victors – possibly also as the defeated; as custodians or possessors of honour, loyalty, duty; and as guardians and protectors of the fatherland. The identity is created by the survivors and offered to future generations. The maxim mortui viventes obligant (“the living are obliged to the dead”) compensates for the lives lost and gives meaningfulness to those who are still alive. Violent deaths (which deaths in war obviously are) have to be legitimised. Again, this search for the purpose (the “dying for…” inscription in war memorials) is created by the survivors and not the dead. Inventing a reason for those deaths and carrying it on through generations (with some changes, of course) is done on a collective level. Mostly it is the national level which engages the whole spectre of people living in one country with a government on the top of it. The success of the identity-building process lies in the homogeneity of the survivors. In this sense, the war memorials began to function as the sites of worship of the nation, gradually leaving Christianity on the sidelines (while not completely excluding it). If before, transcendence was reached individually by fulfilling one’s duty as a Christian; at the time of the French Revolution, transcendence became an act of fulfilling one’s duty in front of the nation, which was only possible collectively. Collectiveness meant equality in front of the face of the nation, which consequently meant that everyone deserved to be commemorated (for example, with an individual grave or being mentioned in a list among other dead). The bloodshed of WWI, however, brought an end to individual commemoration: it was hard to distinguish between people in the masses of remains. The solution was the tomb of the unknown soldier. Bringing the remains to the national capital and burying them next to the eternal flame was meant to link anonymous death with the highest symbolic meaning of sacrifice. His name is unknown and therefore he could be anyone which served as relief for relatives and as a reminder for young soldiers of their duty in front of the nation. Looking at the site of memory in Kaunas, the “dying for…” is clear: the highest aim of the Lithuanian nation is freedom, which culminates in the establishment and defence of the Lithuanian state. Here, self-governance, the right to decide the nation’s exclusive fate, stands above any personal aspirations and is definitely worth dying for. The fallen are identified as heroes and martyrs. This, for example, is indicated in the inscriptions below the busts of Antanas Juozapavičius and Povilas Lukšys: they did not simply die in action; they were the very first ones to spill their blood. The presence of many crosses also refers towards the interpretation that all those fallen for Freedom fulfilled not only their patriotic but also their Christian duty. The presence of both the first officer and soldier also indicates the equality and homogeneity among the members of one nation: despite their differences they served the same higher entity. Additionally, the motto on the altar (“Pay what you owe”) is another symbol of the “dying for…” Even if the free Lithuanian state would not have been the most explicit reason for dying, the words inscribed in the Altar under the Eternal Flame still had created a sense of owing something. In the case of the Monument to the Fallen and its surroundings it would have meant being in debt for being a Lithuanian and a Catholic. Free Lithuania as the justification of death which is explicitly or implicitly inscribed in all the monuments seems to be the idea which was worshipped here (and to some extent, continues to be worshipped nowadays). Erecting a Grave of the Unknown Soldier is strange, given that there were only 4,000 deaths in the Wars of Independence, which meant there were no great battles which could have turned many people into a mass of unrecognisable remains. Additionally, the unknown remains were excavated in Latvia almost 15 years after the war, whereas, for example, the Tomb of the Unknown Soldier in Paris was created two years after the end of WWI. Therefore, the Grave in Kaunas could have served another aim: for example, the state of war with Poland (which continued from October 1920 – March 1938; Kaunas had become the provisional capital of Lithuania because Vilnius was under Polish control, despite the peace treaty signed after the military action between the two states). The forced moving to Kaunas could be the reason why the Garden of the War Museum became so thick with various monuments commemorating those fallen for their country, because the true capital – Vilnius – was out of reach. This constant state of war might have been behind the decision to create the site: in order to secure the territories, Kaunas in particular, belonging to Lithuania, by burying a martyr in the city centre. Even nowadays, Kaunas is considered to be the heart of Lithuanianness within the country, not only linguistically but also geographically – as one famous song goes: ‘Kaunas – Lietuvos širdis’ (‘Kaunas – the heart of Lithuania’). In his attempts to create a typology of WWI monuments in France, Antoine Prost says that the process of commemorating the fallen started long before it was clear that France would be victorious in the conflict. At the beginning ordinary people started gathering in the cemeteries on November 1 and 2 to remember their relatives and friends who had already lost their chance to return home alive. The tradition continued after the war, when individual communes (villages, small towns) started commemorating the dead in stone. Usually situated at crossroads, next to a church or a town hall – or, in some cases, in cemeteries – they were the representative of the national spirit coming from below. In larger cities and Paris, constituting nationalism on the official (state) level, the process of planning, founding and finding a place for a war memorial lasted longer and the highest political ranks were involved in it. The civic monument was a place for a communal remembrance of relatives, creating a rather closed memory community with insignificant intervention of the national (state) level and with avoidance of the religious signs. The patriotic monuments were also erected in significant public spaces. The shift from civic to patriotic is indicated by adding the formula “dead for the Fatherland” (“de la Patrie”). The funerary monuments were erected in cemeteries or next to churches, away from secular centres of communities. Crosses appear in many of them. Indeed, they glorify not the victorious Fatherland but the sacrifice of the dead. In their conservative tradition, the Fatherland, like God, becomes a transcendent reality, which justifies the sacrifice that becomes martyrdom, witness, and act of faith. This is a long way from the republican spirit, for which the individual is the ultimate end of society and which proclaims a message of individual and collective emancipation. Applying the given typology to our case in Kaunas, we should start with the location. The Monument to the Fallen for Lithuania’s Freedom and its surroundings were erected in central Kaunas and became a place for official ceremonies. Following Prost, this site of memory could not be funerary simply because of its location. Therefore, it was either civic or patriotic. In France, the first one was the place for a communal remembrance of relatives and friends killed in war and not a space for pompous ceremonies including foreign representatives. In conclusion, our lieu de mémoire could only be patriotic. In 1938, the busts of Antanas Juozapavičius and Povilas Lukšys were added. Created 20 years after their death, they were idealisations, not only because of their solemn and heroic appearance, but also because of the inscriptions below the busts. It is a unique case (I do not know any other) of commemorating the very first victims of war, especially in the central state memorial. The words “Reborn Lithuania’s soldier/officer, first killed for its freedom” are simultaneously reminiscent of the French “la Patrie” and the Christian conception of martyrdom. The same message could be read in the inscriptions both on the Monument to the Fallen and the Tomb of Unknown Soldier – they all emphasize Freedom. Here, the ideal of Freedom, free, awakening Lithuania substituted for the French “la Patrie” and, of course, it is understandable: if the French people had fought for the country that had been continuously existing long before, Lithuania as a country had fought for its de facto independence. The signs refer to a patriotic type of the Monument to the Fallen and its surroundings. At the same time, our realm of memory cannot be described as a solemnly patriotic one. Even though it was not erected in a cemetery or next to a church, both the cemetery and the church were brought here. The wooden crosses and other religious symbols were carried here from different parts of the country. The Monument to the Fallen, in addition to its Catholic cross and the shield of Vytis, was crowned by a big metal cross brought from Žemaitija in 1923. In November 1934, the remains of the Unknown Soldier were buried in front of it. The Altar with the Eternal Flame (“Pay what you owe”) was not only a sign of remembrance but rather it was another reminder of the duty in front of God and Lithuania. Therefore, the site of memory in Kaunas is funerary-patriotic, a place where both God and the Freedom of the Fatherland were worshipped equally. The aim of the Monument was not as much to pay tribute to the fallen as to concentrate on raising future generations in a patriotic and religious spirit. As we can see, the Monument to the Fallen for Lithuania’s Freedom and its immediate surroundings fit into the wider European paradigm. At the same time, there are some important peculiarities here, due to the different developmental paths of Lithuania and Western European countries. The Garden of the War Museum of Vytautas the Great is a particularly rich example definitely worth further exploration in terms of historical memory. Kaunas and its monuments are there to be explored in detail by everyone, applying knowledge which knows no borders.